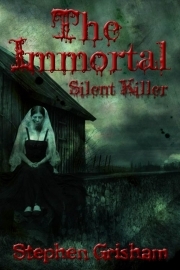 Description of "The Immortal (eBook)"
Haunting her ever since his death, Mark would always carry around her brother's urn enduring the whispers that would accuse her at every turn. Now a prisoner, those whispers have become louder and with them hallucinations of the thing she truly did not want to be. Mark is alone now, or that’s what she wanted. However, life is a funny thing, it seldom grants people wishes without a price. Sometimes she can’t tell what’s reality and what’s an illusion, the voice of her brother resounded from the urn she carried, chanting the words traitor, traitor. At first they were whispers, things she could ignore, things she could disregard. She was so close to ridding herself of them, into the open flame that night, but as fate would have it, life decided to be unkind and take away her wish in a blaze of fire and shrapnel. Throwing her into a place where those whispers became shouts and the only remedy was the feeling of a blade in her hands. Stephen has been writing professionally since young and living in New Mexico with his wife and two dogs, Tobby and Champion. He enjoys writing science fiction as well as fantasy and had won a few writing contests for short stories when he was younger. He always had passion for creativity, in his spare time, Stephen would listen to the music of world famous composer Ludwig Van Beethoven. Reviews of "The Immortal (eBook)"